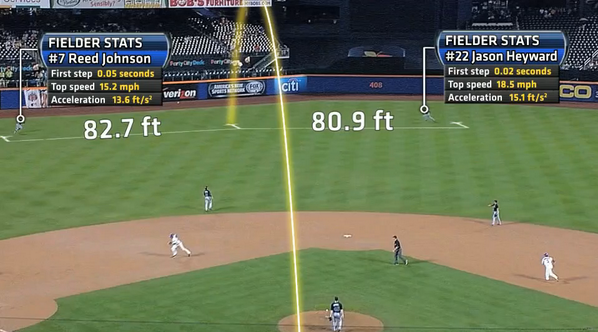 This page contains links to articles about the new MLB tracking system known as Statcast. Jason Hayward runs 80.9 ft along a nearly straight-line path to make a spectacular diving catch. At the Sloan Sports Analytics Conference in Boston on March 1, 2014, MLBAM made a presentation about a new tracking system that will effectively track everything on the field: the pitched and batted baseball and all the players. Although not officially announced, it is my understanding from discussions with people in the know that the new system is a merger of radar and video technology, taking full advantages of the strenghts of each. Doppler radar is the natural technology for tracking the baseball. Video is the natural technology for tracking the players on the field. Together, they offer a powerful tool that has the potential to revolutionize baseball analytics. A great example of how the tracking technology might be used in broadcasts is shown in this clip. The new technology is a partnership between Trackman for the Doppler radar and ChyronHego for the video. The new system was installed at Miller Park in Milwaukee, Target Field in Minnesota, and Citi Field in New York for the 2014 season. It was also used for the 2014 All Star Game and extensively used during the 2014 postseason. A rollout to 29 USA parks (with Toronto still under discussion) is expected for 2015. It is still not known how much, if any, of the data will be publicly available. This a link to Daren Willman's site baseballsavant.com. Go there to obtain StatCast batted ball data for the 2015 season, including batted ball speed, launch angles, and distances. Also included are all the pitch data. Want to know who hits the ball hardest. Download the data and you will find out. 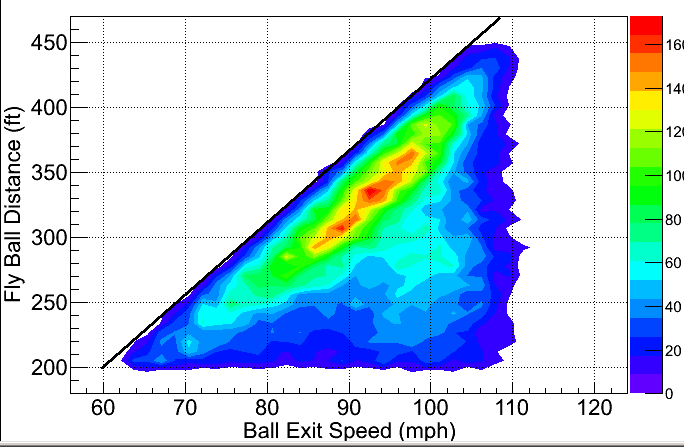 The above plot (updated July 12, 2015) shows the relationship between fly ball distance and batted ball speed, with the color indicating the density of fly balls in that region of the plot. For a given speed, there is a broad range of distances, primarily due to different vertical launch angles, which were not recorded. However, there is a maximum distance for a given batted ball speed shown by the solid black line. That line extrapolates to about 535 ft at the largest recorded batted ball speed of 120 mph. However, there seems to be some indication that the data "rolls over" at the highest speed (>105 mph). More data will be needed to confirm whether or not this is actually the case. This article appeared on February 27, 2015 and was written by Jason Dachman of Sports Video Group. It is the best discussion I have seen on the interplay between Trackman and ChyronHego for tracking the baseball. This article appeared in the February 18, 2015 edition of The Hardball Times and was written by physics professor Dave Kagan. Dave uses StatCast data to do a quantitative analysis of the physics of fielding, utilizing a Lorenzo Cain catch as an example. This article reminds me of an earlier article by ex-MLB pitcher Dave Baldwin and engineering professor Terry Bahill entitled A Model of the Bat’s Vertical Sweetness Gradient. The article looks at how the ball-bat offset affects the batted-ball trajectory, especially the hang time, and from that makes quantitative statements about the probability that the ball will be fielded. This is a link to the Master's thesis of Johan Borg, Department of Electrical Engineering, Linköping University, Sweden. The objective of this thesis is to investigate if it is possible to use stereo vision to find and track the players and the ball during a football game. The techniques outlined in this thesis form the basis for player-tracking in the Statcast system using the ChyronHego cameras. Unlike the PITCHf/x system, which uses two cameras with nearly orthogonal optical axes, the stereo system studied here uses two cameras separated by a fixed distance but with nearly parallel optical axes. by @DCameronFG, published March 2, 2014 in FanGraphs. by @Ben_Lindbergh, published March 3, 2014 in Baseball Prospectus. by @JonahKeri, published March 4, 2014 in Grantland. an SI.com story by Ben Reiter, commenting on four video clips from Citi Field in May 2014. Tom Tango's blog had an interesting related discussion about RUNf/x and measuring a baserunner's accelerations. by Matthew Leach of mlb.com. by Paul Casella of mlb.com.